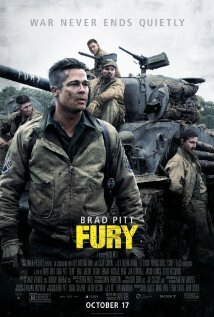 Rather than a remake of the 1936 Spencer Tracy/Sylvia Sidney movie of the same name, Fury is a gritty World War II drama set in Germany in April 1945 in the closing days of the war. Brad Pitt plays Sergeant Collier, the battle-hardened (“I’ve killed Germans in North Africa, Belgium, France, and now I’m killing Germans in Germany.”) leader of a tank squadron. American tanks are inferior to German tanks, so, besides Sergeant Collier, there are only three men left in his group. When a very young recruit named Norman (played by Logan Lerman, who was Noah’s son earlier this year) is assigned to them, they soon discover he is all wrong for the job he is supposed to do. He has been trained as a clerk typist to type sixty words a minute and has not been battle-tested. Sergeant Collier is a kind of father figure to the men in his group, as unlikeable as they are. He has promised them he will do whatever he can to help them make it through the war alive and we see he is very committed to delivering on his promise. He has to be brutal to “toughen up” Norman to make him overcome his natural reluctance to kill the enemy. As he explains to Norman in one of their quieter interludes, “Ideals are peaceful; war is violence.” We see that, in war, one sheds ones ideals and does whatever it takes to survive, even if doing so seems “wrong” at the time. The emotional core of the movie is the friendship between Sergeant Collier and his men and, specifically Norman, the young, naïve, untested boy/man.